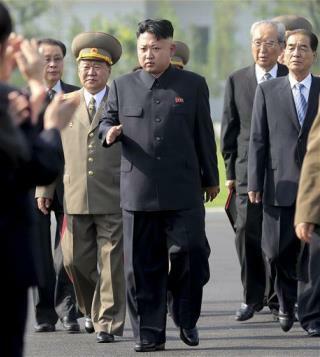 Kim Jong Un's Health Mystery Solved? (Newser) – South Korea's spy agency thinks it has solved one of 2014's great mysteries: why Kim Jong Un disappeared for six weeks. (He's not only back in view, he's inspecting kids' tea sets.) Two lawmakers tell Yonhap that the National Intelligence Service revealed that a cyst was the problem. The agency says it was removed from his right ankle sometime in September or October, and that a foreign doctor was brought in to facilitate the operation. NIS expressed that the cyst could recur due to Kim's weight and busy public schedule, reports the AP, which notes it's unclear how NIS sourced the info and points out its track record is "spotty." Fifty people have been put to death in 2014. Ten party officials were booted over watching South Korean soaps. Five of the country's prison camps have been made larger; NIS believes they currently contain 100,000 people. Many of you don't have a clue about the communists. Every time the sanctions are increased the people of their country suffer the most and there is nothing that they can do to bring the communist regime down. Executions are very common, God only knows how many opposition people Stalin killed in Soviet Union and in Europe. This is definitely not a laughing matter, I hope they are rotting in Hell along with those to come. Oh thank God, I thought he was dead. He needs to hop on Marie Osmond's Nutrisystem weight loss plan.